With almost a billion (yes, I said billion) users, chances are your business is already on Facebook and you might have a Twitter feed too, but there are other social media tools out there that you may want to consider using to help boost your business. We’ll take a look at three of these tools, discuss why you should care, and offer some quick tips on getting the most out of them. Not every tool is going to be right for every type of business, but hopefully you’ll be inspired to try something new. Why you should care: People view about 15 billion videos on YouTube a month. Google owns YouTube and I’m pretty sure that Google owns the Internet too! YouTube is good for SEO (search engine optimization) and can help get your website to the top of search listings. How to use it: Most businesses don’t use YouTube because they think that making videos is difficult and expensive. Sure, making some professional videos can be difficult and expensive, but your YouTube videos don’t have to be professional. In fact, having an amateurish quality to your videos can actually lend a feeling of authenticity. That being said, quality does matter. Make sure people can hear what you are saying and that they can see what you are talking about. It is a visual and audible form of media, after all. Don’t be afraid to contact a local videographer for help. I’m sure they can work within a budget and offer advice and expertise to make your videos better. But what kind of videos should you make? Customers want to watch a commercial that is super creative. They want to see videos that address their needs, such as how-to, advice and behind the scenes clips. Help the customers make tough buying decisions by talking about the pros and cons of two similar products. Show them how to create great holiday cupcakes or take them on a tour of your production facility. When you are ready to upload the video, be sure to name and tag it with the search terms you want it to appear in. For example, “Holiday Cupcakes: How to bake great holiday cupcakes.” Give a detailed and thorough description and add your website’s URL at the beginning so people can click it and find you. Why you should care: A relative newcomer on the block, Pinterest has gotten a lot of buzz lately. Most of it came in February when it was revealed that it was driving more referral traffic than Google+, LinkedIn and YouTube. This turned a lot of heads. Pinterest is a visual bookmarking tool that lets people share images called “pins” and collect them into groups called “boards”. People can ‘like’ pins, comment on them or repin them on their own boards. How to use it: Remember that marketing, at its core, is as much about who we are, as it is who we want to be. Many of the images shared on Pinterest are aspirational and inspirational; places I’d like to go, things I’d like to see, clothes I’d like to buy, food I’d like to eat, etc. As a business, share images that connect with people in those ways. When sharing product photos make sure the image links back to your website. That way you can tap into that sweet referral traffic. But make sure you balance promotion with engagement. Watch what your customers pin and take note of what interests them. It’s just as much about sharing in the community of your business as it is about selling product. Be a source of inspiration for your customers. Why you should care: It’s Google and I’m sure you use them every day for search, email and probably other things as well. They have successfully integrated themselves in almost everything we do on the Internet. Compared to Facebook, Google+ might seem miniscule in terms of number of users. 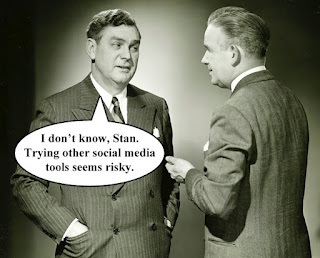 But Google+ and the +1 button are extremely powerful in getting you seen on the Internet. Google likes it when you use their products, and sharing content through Google+ can help your site and your content be more visible on the Internet. Google+ is a social network that focuses on content, allowing you to follow people who have similar interests to yours and choosing who sees the content that you share. How to use it: In most ways, Google+ works a lot like Facebook where you can share status updates, links, photos, videos, etc. The main difference is in how it is integrated with their other products. When you are signed in to your Google account and search for something, lets say laptop bags, at the top of your search results you’ll see if people in your Circles have commented, +1’d or linked to references to laptop bags. If you use Google Reader, those results will show up as well. This is what Google refers to as “Social Search”. If a friend of yours found a link valuable, you are more likely to find it valuable as well. Also, things posted to Google+ are searchable by Google, whereas things posted on Facebook are not. The other main aspect of Google+ is the +1 button. This is similar to Facebook’s Like button, but not limited to the confines of a social network. You can +1 web sites, products, articles, blog posts, etc. and these will have impact on other people’s search results. Google gives preference in its search results to things that have been +1’d. If you enable people to +1 your products and your competition doesn’t, that could give you an edge in search results. At its heart, Google+ is about passions. While we may have 200 friends on Facebook, only a few of them might be as interested in knitting as we are. On Google+, you can find friends as well as strangers who enjoy the same things you do and engage with them. As a business, finding and connecting with people who are passionate about your business is invaluable. Think about how these social tools might fit in with your business community. A photography studio might find Pinterest to be a much better fit than Twitter. Whereas a bookstore might find Google+ more effective than YouTube. You don’t have to be everywhere, just in the right place. And you might not know where that is until you try it. So give these social sites a shot and see if they work for you.